Laura Aguirre from Laura's Little Party is here to share her adorable toddler Halloween party and to show up how she put it together! 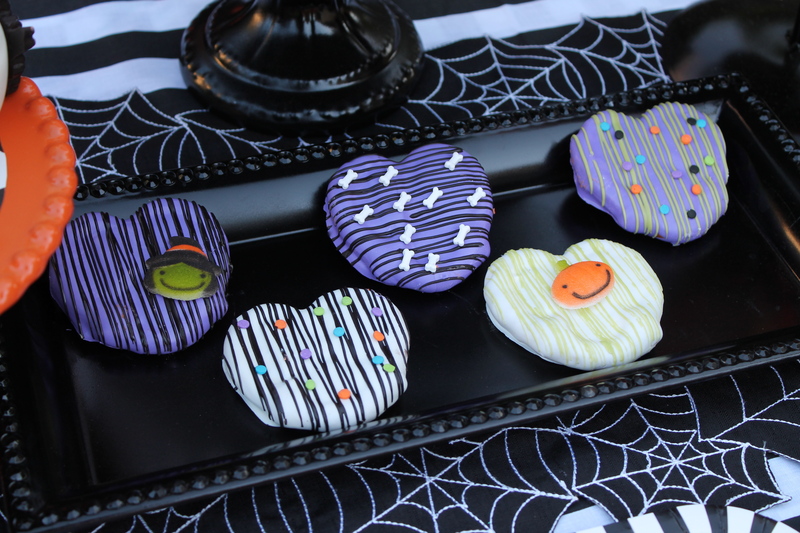 Halloween time is one of our favorite times of the year! 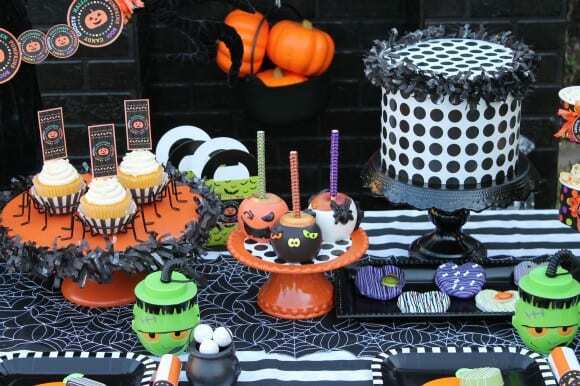 My family looks forward to dreaming up fun costumes, carving pumpkins, and of course, Halloween parties! Because my youngest two children are toddlers, I feel the need to keep the spooky decor to a minimum. 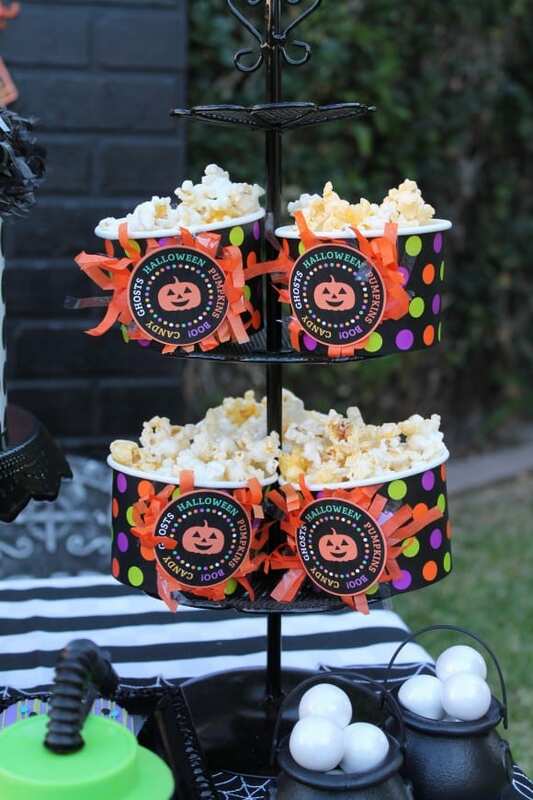 But that doesn’t stop us from having a great time with our party treats & decor! I love having parties outside. And the gloomy weather made it more fun. This year I created a festive Halloween spread that included spooky-fun chocolate caramel apples, tasty Oreo cookies, delectable caramel pretzels, cupcakes, and popcorn. I opted to keep the candy scarce, in preparation for the buckets of candy the kids will bring home after they trick-or-treat! I picked out a cute Halloween free printable party set designed by Printbelle for Catch My Party. I printed, cut, and attached the printables to treat boxes, the tops of cupcakes, napkins, and snack cups. Along with a colorful trick-or-treat banner, I created another banner, using different sizes of circle tags. Our party table wasn’t very hard to create. 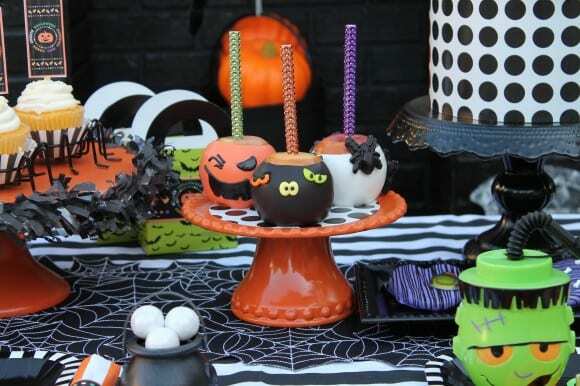 I like to buy store-bought treats, and mix them with special ordered treats, such as the candy apples, chocolate covered oreos, and caramel pretzels. I also enjoy doing a few DIY projects, whenever I get the chance. 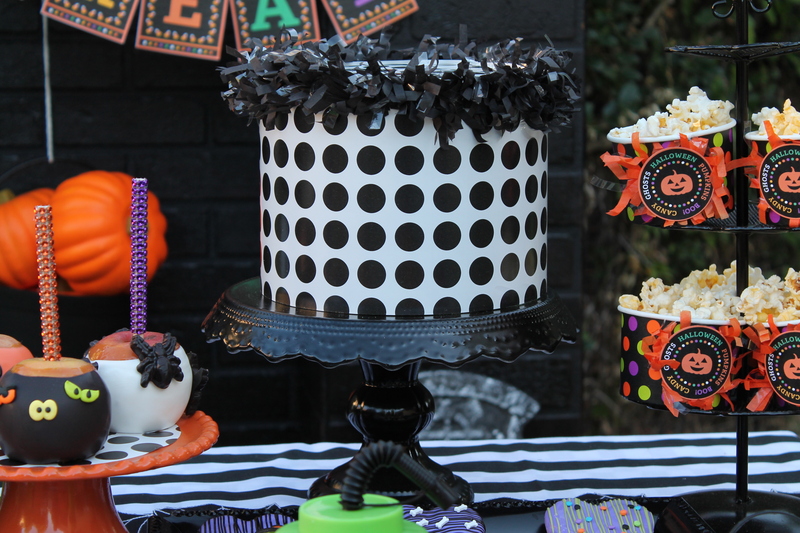 I spray painted a few of my cake stands, to match the party decor. I even added some tissue festooning around the edge to give it a more festive look. I also created a faux cake! This is something I’ve wanted to do, and I’m so happy I did. 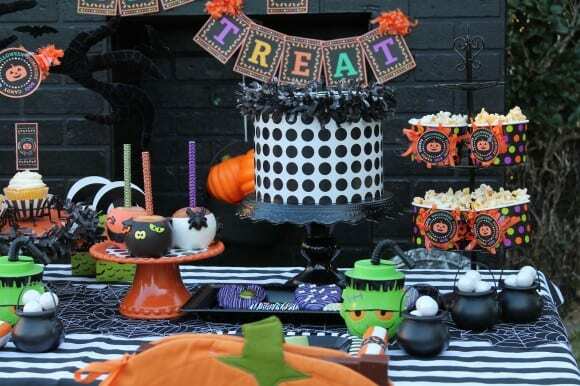 It was easy to create, inexpensive, and added a bit of whimsy to our party table. 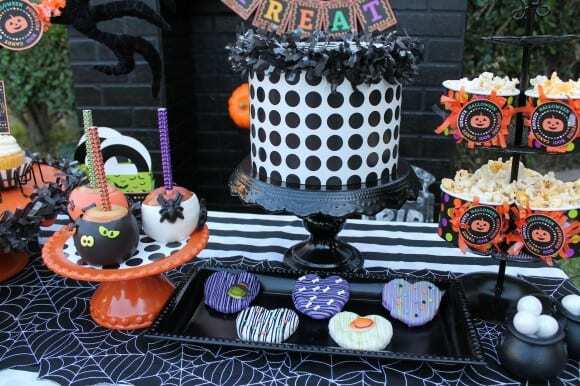 For the faux cake, you can use various shapes & sizes of styrofoam. (different sized boxes will also work). I picked up a few 2” styrofoam rounds from Dollar Tree. I stacked the rounds to the desired height for my cake, covered them with polka dotted wrapping paper, and attached with tape. Because the top of the cake round was exposed, I cut out a circle piece of wrapping paper, and attached it to the top. To disguise the “seam” of the paper, I attached black tissue festooning, and voila! You’ve got a fun, festive, and inexpensive cake for your party table! 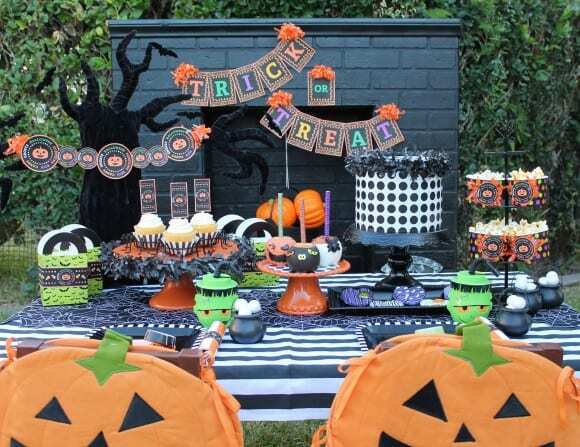 I used striped fabric for a table cover, and added a spooky spiderweb runner that I found at HomeGoods. 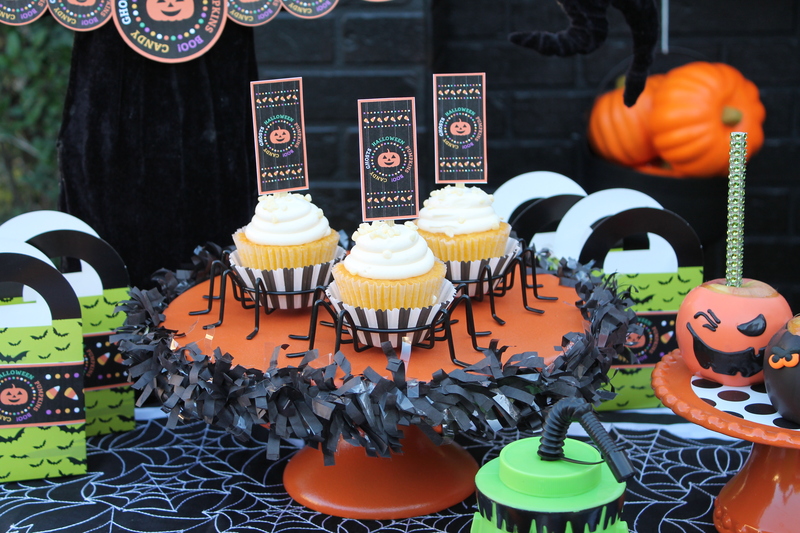 I picked up some cute spider cupcake holders, and placed them on a cake stand. 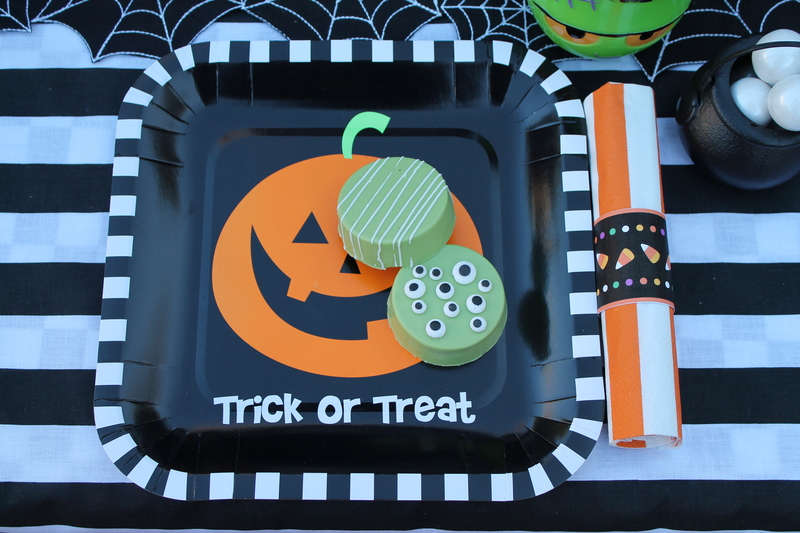 Paper plates, striped napkins, and fun Frankenstein head cups were a fun touch. And I couldn’t forget the bubbling cauldrons. 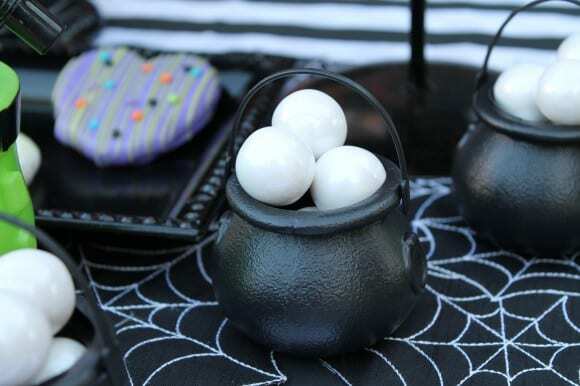 I used a package of mini black cauldrons from Party City, and filled them with white gum balls that served as the “bubbles” of a boiling witch’s brew. I hope my Halloween party will help inspire you to throw something spooky-cool for your little Monsters. Happy Halloween! Thank you, Laura for all your creative ideas! 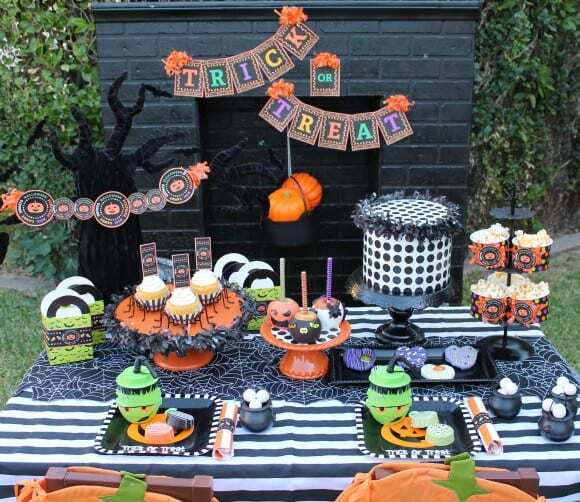 I'm hoping lots of toddlers will get to enjoy parties because of your inspirations. 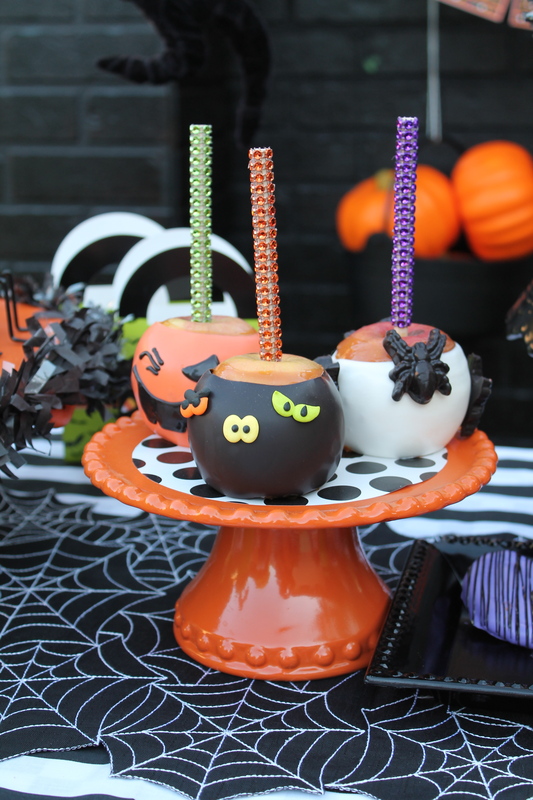 Chocolate caramel apples, chocolate covered Oreos, caramel pretzels: Bella’s Bakery & Bowtique. To learn more about Laura, please find her at Laura's Little Party and on Facebook and Pinterest.